↑ Menon, Meena. "Leader who brought ethnic politics to Mumbai melting pot", The Hindu, 17 November 2012. 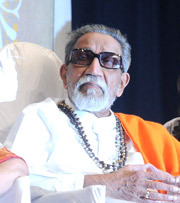 Profile by BBC dated 19 July 2000 referring to him as the "uncrowned monarch of Maharashtra"